and interrelated global problems of energy utilization and environmental control each has a substantial and inescapable ‘materials dimension’. The engineer is primarily concerned with the functionof the component or structure, frequently with its capacity to transmit working stresses without risk of failure. The secondary task, the actual choice of a suitable material, requires that the materials scientist should provide the necessary design data, synthesize and develop new materials, analyse failures and ultimately produce material with the desired shape, form and properties at acceptable cost. 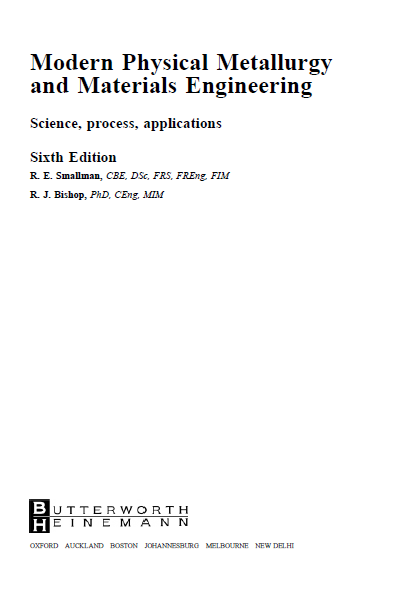 This essential collaboration between practitioners of the two disciplines is sometimes expressed in the phrase ‘Materials Science and Engineering (MSE)’. So far as the main classes of available materials are concerned, it is initially useful to refer to the type of diagram. The principal sectors represent metals, ceramics and polymers. All these materials can now be produced in non-crystalline forms, hence a glassy ‘core’ is shown in the diagram. Combining two or more materials of very different properties, a centuries-old device, produces important composite materials: carbon-fibre-reinforced polymers (CFRP) and metal-matrix composites (MMC) are modern examples. Adjectives describing the macroscopic behaviour of materials naturally feature prominently in any language. 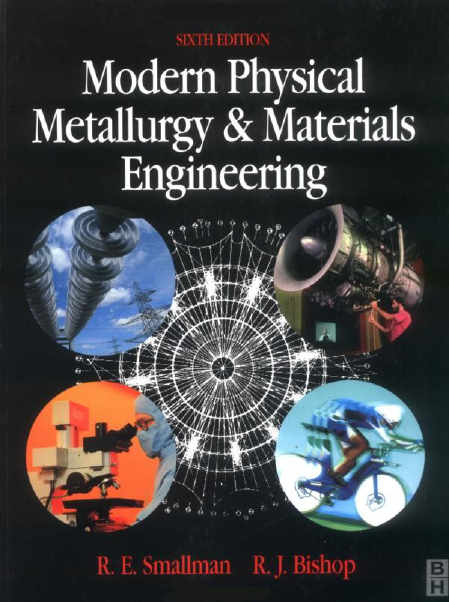 We write and speak of materials being hard, strong, brittle, malleable, magnetic, wear-resistant, etc. Despite their apparent simplicity, such terms have depths of complexity when subjected to scientific scrutiny, particularly when attempts are made to relate a given property to the internal structure of a material. In practice, the search for bridges of understanding between macroscopic and microscopic behaviour is a central and recurrent theme of materials science. 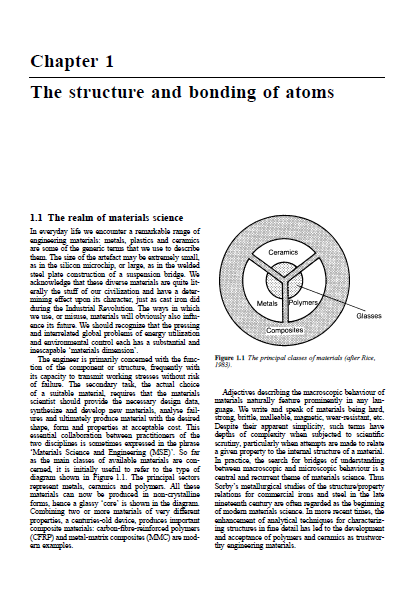 Thus Sorby’s metallurgical studies of the structure/property relations for commercial irons and steel in the late nineteenth century are often regarded as the beginning of modern materials science. 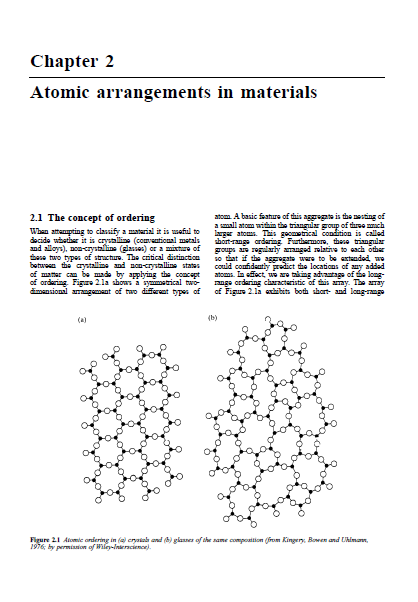 In more recent times, the enhancement of analytical techniques for characterizing structures in fine detail has led to the development and acceptance of polymers and ceramics as trustworthy engineering materials.Having outlined the place of materials science in our highly material-dependent civilization, it is now appropriate to consider the smallest structural entity in materials and its associated electronic states. according to the classical laws of electrodynamics, emit energy continuously in the form of electromagnetic radiation, Bohr, in 1913, was forced to conclude that, of all the possible orbits, only certain orbits were in fact permissible. These discrete orbits were assumed to have the remarkable property that when an electron was in one of these orbits, no radiation could take place. The set of stable orbits was characterized by the criterion that the angular momenta of the electrons in the orbits were given by the expression, where h is Planck’s constant and n could only have integral values (n D 1, 2, 3, etc.). In this way, Bohr was able to give a satisfactory explanation of the line spectrum of the hydrogen atom and to lay the foundation of modern atomic theory. In later developments of the atomic theory, by de Broglie, Schrodinger and Heisenberg, it was realized that the classical laws of particle dynamics could not be applied to fundamental particles. In classical dynamics it is a prerequisite that the position and momentum of a particle are known exactly: in atomic dynamics, if either the position or the momentum of a fundamental particle is known exactly, then the other quantity cannot be determined. In fact, an uncertainty must exist in our knowledge of the position and momentum of a small particle, and the product of the degree of uncertainty for each quantity is related to the value of Planck’s constant. In the macroscopic world, this fundamental uncertainty is too small to be measurable, but when treating the motion of electrons revolving round an atomic nucleus, application of Heisenberg’s Uncertainty Principle is essential. The consequence of the Uncertainty Principle is that we can no longer think of an electron as moving in a fixed orbit around the nucleus but must consider the motion of the electron in terms of a wave function. This function specifies only the probability of finding one electron having a particular energy in the space surrounding the nucleus. The situation is further complicated by the fact that the electron behaves not only as if it were revolving round the nucleus but also as if it were spinning about its own axis. Consequently, instead of specifying the motion of an electron in an atom by a single integer n, as required by the Bohr theory, it is now necessary to specify the electron state using four numbers. These numbers, known as electron quantum numbers, are n, l, m and s, where n is the principal quantum number, l is the orbital (azimuthal) quantum number, m is the magnetic quantum number and s is the spin quantum number. Another basic premise of the modern quantum theory of the atom is the Pauli Exclusion Principle. This states that no two electrons in the same atom can have the same numerical values for their set of four quantum numbers. If we are to understand the way in which the Periodic Table of the chemical elements is built up in terms of the electronic structure of the atoms, we must now consider the significance of the four quantum numbers and the limitations placed upon the numerical values that they can assume. The most important quantum number is the principal quantum number since it is mainly responsible for determining the energy of the electron. The principal quantum number can have integral values beginning with n D 1, which is the state of lowest energy, and electrons having this value are the most stable, the stability decreasing as n increases. Thus if n D 1, l can only have the value 0, while for n D 2, l D 0 or 1, and for n D 3, l D 0, 1 or 2. The orbital quantum number is associated with the angular momentum of the revolving electron, and determines what would be regarded in non-quantum mechanical terms as the shape of the orbit. For a given value of n, the electron having the lowest value of l will have the lowest energy, and the higher the value of l, the greater will be the energy. The remaining two quantum numbers m and s are concerned, respectively, with the orientation of the electron’s orbit round the nucleus, and with the orientation of the direction of spin of the electron. For a given value of l, an electron may have integral values of the inner quantum number m from Cl through 0 to l. Thus for l D 2, m can take on the values C2, C1, 0.. The energies of electrons having the same values of n and l but different values of m are the same, provided there is no magnetic field present. When a magnetic field is applied, the energies of electrons having different m values will be altered slightly, as is shown by the splitting of spectral lines in the Zeeman effect. The spin quantum number s may, for an electron having the same values of n, l and m, take one of two values 2 . The fact that these are non-integral values need not concern us for the present purpose. We need only remember that two electrons in an atom can have the same values for the three quantum numbers n, l and m, and that these two electrons will have their spins oriented in opposite directions. Only in a magnetic field will the energies of the two electrons of opposite spin be different. 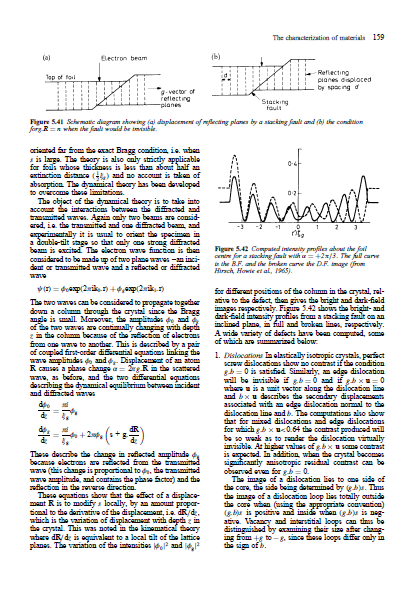 Real solids invariably contain structural discontinuities and localized regions of disorder. This heterogeneity can exist on both microscopic and macroscopic scales, with defects or imperfections ranging in size from missing or misplaced atoms to features that are visible to the naked eye. The majority of materials used for engineering components and structures are made up from a large number of small interlocking grains or crystals. It is therefore immediately appropriate to regard the grain boundary surfaces of such polycrystalline aggregates as a type of imperfection. Other relatively large defects, such as shrinkage pores, gas bubbles, inclusions of foreign matter and cracks, may be found dispersed throughout the grains of a metal or ceramic material. In general, however, these large-scale defects are very much influenced by the processing of the material and are less fundamental to the basic material. More attention will thus be given to the atomic-scale defects in materials. Within each grain, atoms are regularly arranged according to the basic crystal structure but a variety of imperfections, classified generally as crystal defects, may also occur. A schematic diagram of these basic defects is shown in Figure 4.1. -> Volume defects, such as voids, gas bubbles and cavities. Real crystals, however carefully prepared, contain lattice imperfections which profoundly affect those properties sensitive to structure. Careful examination of the mechanical behaviour of materials can give information on the nature of these atomic defects. In some branches of industry the common mechanical tests, such as tensile, hardness, impact, creep and fatigue tests, may be used, not to study the ‘defect state’ but to check the quality of the product produced against a standard specification. Whatever its purpose, the mechanical test is of importance in the development of both materials science and engineering properties. It is inevitable that a large number of different machines for performing the tests are in general use. This is because it is often necessary to know the effect of temperature and strain rate at different levels of stress depending on the material being tested. Consequently, no attempt is made here to describe the details of the various testing machines. straining device. The strain is usually applied by means of a motor-driven crosshead and the elongation of the specimen is indicated by its relative movement. The load necessary to cause this elongation may be obtained from the elastic deflection of either a beam or proving ring, which may be measured by using hydraulic, optical or electromechanical methods. The last method (where there is a change in the resistance of strain gauges attached to the beam) is, of course, easily adapted into a system for autographically recording the load–elongation curve. for such a special alloy is that it should undergo a phase transformation in the solid state. One type of alloy satisfying this requirement, already considered, is that which can undergo an order–disorder reaction; the hardening accompanying this process (similar in many ways to precipitation-hardening) is termed order-hardening. 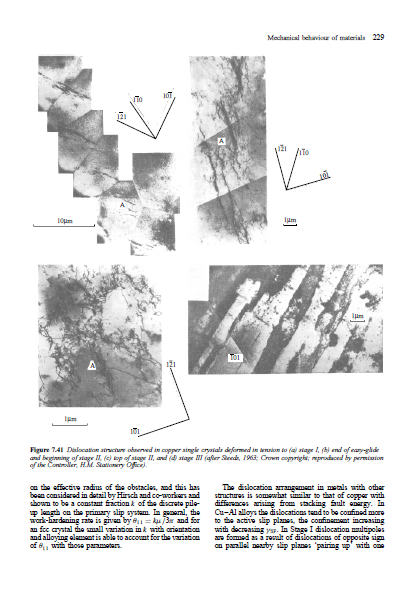 However, conditions for this form of hardening are quite stringent, so that the two principal hardening methods, commonly used for alloys, are based upon (1) precipitation from a supersaturated solid solution and (2) eutectoid decomposition. In engineering applications, strength is, without doubt, an important parameter. However, it is by no means the only important one and usually a material must provide a combination of properties. Some ductility is generally essential, enabling the material to relieve stress concentrations by plastic deformation and to resist fracture. The ability of materials to resist crack propagation and fracture, known generally as toughness, will be discussed in this chapter. Fracture can take many forms; some special forms, such as brittle fracture by cleavage, ductile fracture by microvoid coalescence, creep fracture by triple-point cracking and fatigue cracking, will be examined.